--> India successfully launched the IRNSS-1D, the fourth in the series of seven navigational satellites, onboard PSLV-C27 on 28 March 2015. 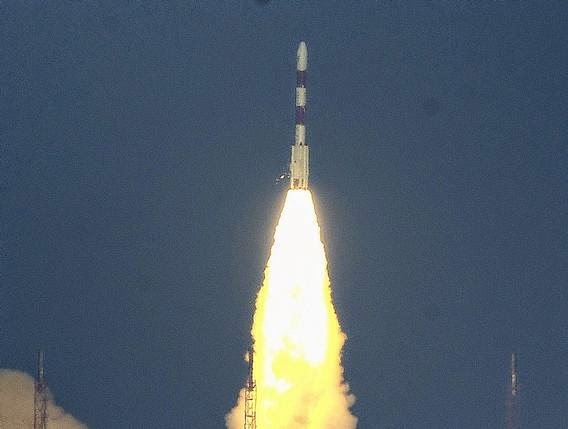 --> Polar Satellite Launch Vehicle (PSLV-C27) lifted off from Satish Dhawan Space Centre, Sriharikota at 5.19pm and placed IRNSS (Indian Regional Navigation Satellite System)-1D weighing 1,425kg in a sub-geostationary orbit after a 20minutes flight. --> PSLV-C27 that lifted off from the second launch pad was an `XL' version of the PSLV rocket as was the case with the previous three launches. --> With the launch of IRNSS 1 D, four active satellites will be transmitting navigation signals. This meets the minimum number of satellites required for the system to be fully functional enabling a navigation receiver to compute position. --> The first three satellites in the series were launched from Sriharikota in July 2013, April 2014 and October 2014. * IRNSS-1D will be the fourth in the series of seven Indian Regional Navigational Satellite System (IRNSS) after IRNSS-1A, IRNSS-1B and IRNSS-1C. * IRNSS-1D was launched onboard PSLV-C27. * It is designed to provide accurate position information services to users in the country as well as the area extending up to 1,500 km from its boundary, which is its principal service area. * The satellite will help in enhancing the satellite based navigation system of India which is currently under development. The navigational system that will develop will be a regional one targeted towards South Asia. The satellite will provide navigation, tracking and mapping services. * The satellite is also one among the seven of the IRNSS constellation of satellites meant to be launched to provide navigational services to the region; while it should also be noted that four satellites would be sufficient to start operations of the system, the remaining three would make it more accurate and efficient. * IRNSS-1D satellite will have two payloads: a navigation payload and CDMA ranging payload in addition with a laser retro-reflector. The payload generates navigation signals at L5 and S-band. The design of the payload makes the IRNSS system inter-operable and compatible with Global Positioning System (GPS) and Galileo. * The satellite is powered by two solar arrays, which generate power up to 1,660 watts, and has a life-time of ten year. * The satellite will be placed in geosynchronous orbit. * The total cost of the launching of satellite and the mission is estimated approximately 1,400 crore Rupees.